Having absolute control of the activity of a molecule in an organism, or deciding when, where and how a drug is activated—these are some of the goals possible with so-called photoswitchable molecules, compounds that change their properties in the presence of certain light waves. The results of a study led by the Institute for Bioengineering of Catalonia (IBEC) together with the Universitat Autònoma de Barcelona (UAB), bring objective this one step closer. Using pulsed infrared light lasers, scientists have activated molecules located inside neural tissue with an efficiency of almost 100 percent. "It's a development that opens the door to a large number of applications, including drugs that only act at the point of the body that is illuminated and are therefore free from unwanted side-effects in other regions, and the spatial and temporal control of any protein whose function we want to study in the context of an organism," says Pau Gorostiza, ICREA research professor and head of the Nanoprobes and Nanoswitches Group at IBEC. The study has recently been published in the journal Nature Communications. The photoswitchable molecule that the researchers used is a new variant of azobenzene, a chemical compound that has a flat shape in the dark, but which bends when exposed to light. Photopharmacology seeks to take advantage of this peculiar property to control the activity of drugs—an inactive drug combined with azobenzene is introduced into the body. The design of the drug only allows its operation when the azobenzene is bent. In this way, the drug will only take effect at the points where the light that stimulates azobenzene is irradiated, thus avoiding the side-effects associated with the drug's action in other areas where azobenzene is present. Until recently, techniques based on photoswitchable molecules used continuous-wave lasers of violet or blue light (one-photon stimulation) to activate these compounds, a method that does not allow focalizing the stimulus. "We wanted the molecule to be activated at a specific point, not along the whole beam of light that we irradiate. We saw that two-photon transitions using pulsed infrared light could achieve this, but the efficiency was very low, and the applications were limited. The molecules we have developed now achieve this effect with 100 percent efficiency. It is a very robust and precise technology to manipulate neuronal activity," said Jordi Hernando and Ramon Alibés, researchers from the Department of Chemistry at the UAB who have supervised part of this work together with Josep Mª Lluch and Félix Busqué. 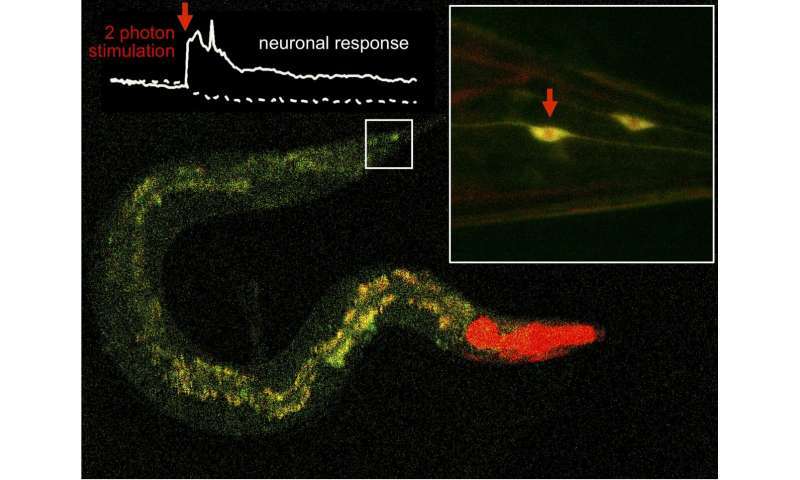 Researchers have proven the effectiveness of the technique on mouse neurons and in an animal model for the study of neuronal circuits, the Caenorhabditis elegans worm. "Despite the cells in a neuronal tissue being very close together, we have managed to select those in which we wanted to activate the photoswitchable molecule." Stimulation via two-photon absorption, predicted by Maria Göppert-Mayer and demonstrated using the pulsed lasers developed by the winners of the Nobel Prize in Physics in 2018, Donna Strickland and Gérard Mourou, has represented a revolution for the visualisation and manipulation of neuronal activity. The results of this development open the door to new lines of research in the molecular field. With the technique described, scientists will possess unprecedented spatiotemporal control over any photoswitchable molecule they wish to investigate.